At first glance I thought they were merely continuing the dragon knights versus lion knights. But it looks like they've revived the black falcons. The first image seems to be slightly misleading. If you read the comments, there is a suggestion about combining two copies of the set, and that appears to be what the first image demonstrates. However it is a very attractive set regardless. The large gate reminds me of the porta negra in Trier (http://en.wikipedia.org/wiki/Porta_Nigra), or the gate house to Lorshe Abbey in Germany (http://en.wikipedia.org/wiki/Lorsch_Abbey). This is really stepping out from the typical square castles or tower-type forts which seem to have made up most of the castle designs over the years. The first photograph with two sets together looks so attractive, I almost think that lego should have created the set that way, and done away with the small peripheral structures. But perhaps they're trying to achieve a middle ground -- Maybe the thinking is that kids (possibly having less pocket money) will enjoy all the play features more and won't be too concerned with the open back to the gatehouse; While AFOLs, on the other hand, might enjoy a more complete architectural structure, and also having more spare cash, would be more likely to pick up two copies of the set. ...just speculating here, I'm probably way off target. But I think that both this set, and the Mill Village Raid are clearly well thought-out efforts by TLG responding directly to a lot of the comments and wishes expressed here and elsewhere by their fans. Thank you, Lego. Last edited by Frank_Lloyd_Knight on Sat Oct 01, 2011 1:27 am, edited 1 time in total. I had thought that they would bring back the Black Falcons, especially when they brought back the Lions. Wow, this set is a definate must have. I'm curious to see the torso under the Black Falcon knight's armor. I'm wondering if it is the same torso that the Dragon knight's have. The legs are the same. A possible alliance between the Dragon and Black Falcon's? If any of our members who is at BrickCon reads this, could you try to take a photo of those armored figs without their armor? I'm just curious to see if they both have printed torsos. Also curious to see what faces they have. Do be warned, the first image posted is TWO sets combined. The actual set is a bit slightly less majestic. 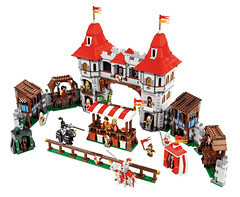 All in all it's a really nice set that reminds be of a Renaissance festival. My only gripe is that there is only 1 Black Falcon. I'd rather 1 Black Falcon soldier/squire and only 1 Lion soldier. I like how the little blue building makes a perfect match for the MMV Inn. 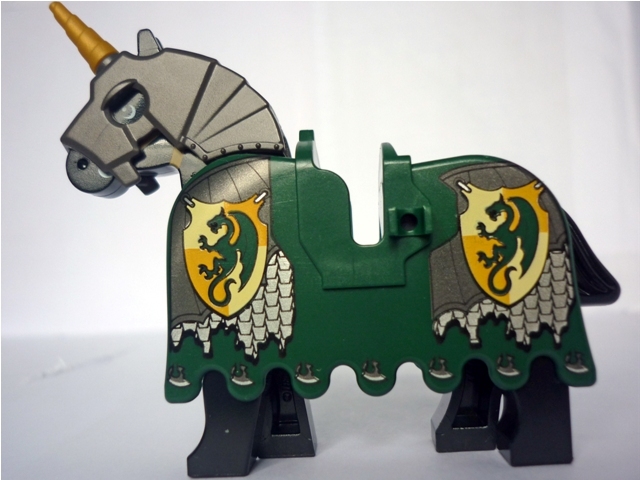 The nobleman's torso is nice, making that 3 male noble torsos for the Lions, and the green princess is NICE! If I could change anything, I'd ditch the 2 tents and add in a Black Falcon noble couple and a new peasant. It looks really cool. Those of you who have money, enjoy. I'll never be able to afford it. does anyone know when is this coming out? I am going to guess January/Christmas. I don't think TLG would pass up Christmas sales on this awesome set. Looks like we will finally have a new supply of 1x3 arches in light bley (previously only available in two sets from 2004). Also, the set is awesome. I will definitely be shelling out the cash to get two and "complete" the set (notice the 4 black 1x1 technic hole bricks at the bottom to attach two sets back-to-back). Lots of nice details here: tiled interior floor, stained glass window, another pitchfork and bucket (but where's the keg??). The green dress would make a nice Elf princess, and the BF barding is nice and neutral in that it has a fleur-de-lis pattern as opposed to a clear BF emblem (also noteworthy is that the printing is across the entire length of the barding and lacking that odd gap found in the middle of the Dragon barding). My first impression was that the design seems somewhat inspired by the 10214 Tower Bridge. The tournament tents are a tad small, but it is nice to see a new coat of arms that isn't in a quartered pattern. I'm really hoping the Black Falcon figure is a prelude to a new faction in Kingdoms' third wave, and not just a one-off appeasement for classic fans, though an additional BF squire fig would be more promising in this respect. If we are lucky enough to see more BFs, I would be surprised if TLG releases a "proper" castle for both the Dragons and Falcons (likely one or the other). If the new BFs aren't fleshed out in Kingdoms, there's always hope in the Collectible Minifigs line. Last edited by BlackenedPurple on Sat Oct 01, 2011 4:10 am, edited 6 times in total. Childhood: The flame that burns its brightest when we are least cognisant of it. I was near to tears when I saw that. Tears of joy. My generation gets Falcons and Crusaders! Thanks for updated the front-page image to the actual set. My oh my, oh my. Wait, doesn't this mean the Black Knights DIDN'T conquer the Falcons?